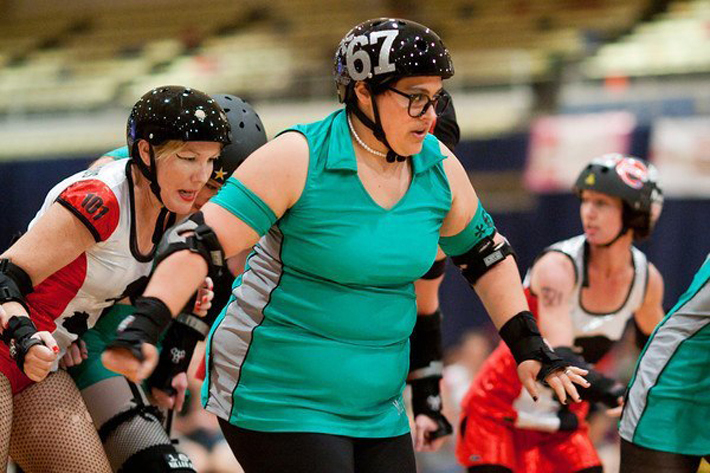 Alumna says encouragement and determination made her a confident roller derby whiz. George Washington University Communications Coordinator Samantha McGovern says roller derby made her a confident athlete. When George Washington University Communications Coordinator Samantha McGovern, B.A. ’ 05, walked into her first bout to watch the D.C. Rollergirls roller derby league seven years ago, a light bulb went off. The only problem was that she didn’t know how to skate. So stubborn, in fact, that she tried out for the league three times and failed. Her fourth attempt landed her a spot on the Majority Whips, the fourth team to form in the league. Since then, Ms. McGovern has served as D.C. Rollergirls media relations chair, secretary and the 2014-15 league president. “There were so many people who encouraged me and made me feel like I could do this,” Ms. McGovern said. “I never took for granted that I was put on the team and the roster and got playing time." Ms. McGovern retired from skating last summer and took up coaching. She balances her league duties with a full-time position at GW as a communications coordinator for the Division of Operations, giving updates to the campus and surrounding community about construction, transportation and other projects. Ms. McGovern arrived at GW as a student with aspirations to become a political cartoonist. During the winding path of her college career, she met and married fellow Colonial Justin Bevers, now Justin McGovern. “We got engaged my senior year, but I’m not very girly, so I didn’t run around screaming about it,” she said. She also found her true passion—storytelling. After graduation, she returned to GW in 2007 to work in operations and facilities and pursue a master’s degree in strategic public relations, which she completed in 2010. “I like telling stories about GW because I believe in what we do here,” she said. Today, Ms. McGovern is the unseen force that ensures “quieter” construction and regimented shuttle routes. She said her goal is to make sure that Division of Operations’ projects—from erecting the Science and Engineering Hall to completing routine renovations on residence halls—are explained and understood by students, faculty, staff and the community. Minimizing disruptions helps campus community members focus on what is important, whether it’s learning, teaching or running different programs, she said. Among her roles, she first considers herself an advocate for students, a role that goes back to her undergraduate years living on campus. “I was one of those students who had the president’s office on speed dial,” she joked. “At the time, I thought that the administration didn’t care if there was a leak or something, but after one day on the job I could see that everyone cares so much, but there is a lot going on. Though independence and determination got her on skates, Ms. McGovern said that derby was also where she learned to rely on teammates for support. When she first started training, she said, she was typically the slowest skater. Faster skaters often take the role of a “jammer,” who scores points, while other skaters are used for defense, offense and assists. Slower skaters can take a “whip.” The maneuver allows a slower skater to take hold of a faster skater’s forearm and hand and use the momentum to propel forward. Initially, Ms. McGovern refused every whip she was offered. Ms. McGovern (far right) lines up with other skaters during a bout as they wait for a "jam" to start. A jam is the two-minute period during which skaters can score points by lapping skaters on the track. Ms. McGovern said that she is often still struck by how graceful, strong and inclusive roller derby athletes are from welcoming anyone who identifies as a woman into their ranks to planning a junior derby league for young girls. 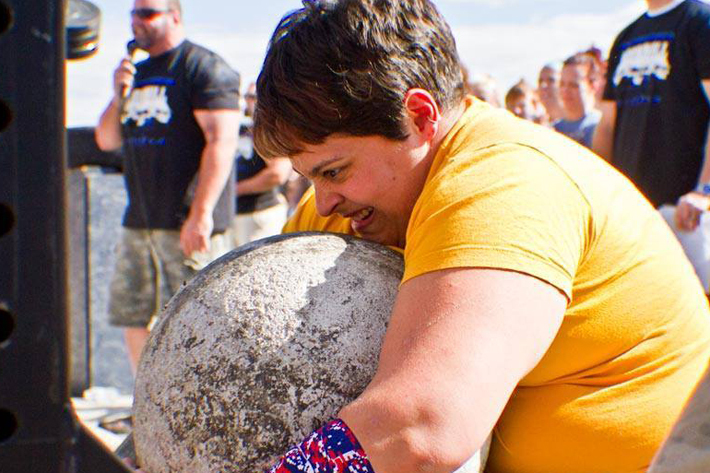 Derby also led Ms. McGovern to her newest passion, weightlifting and “strongman” competitions. 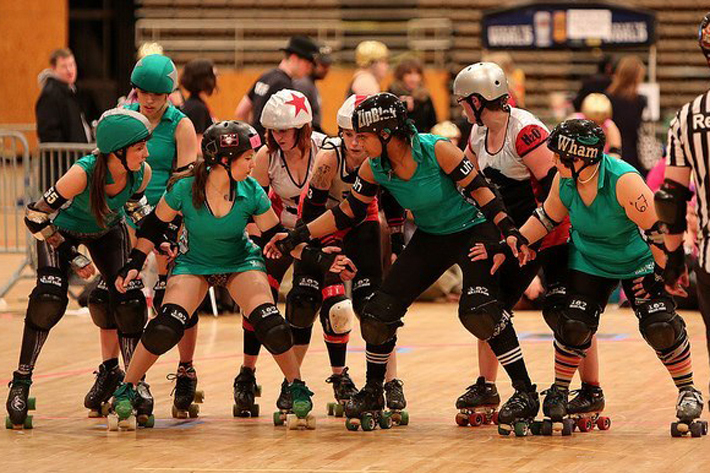 The sport requires intensive strength training and was originally a supplement to her roller derby training. After joining a CrossFit gym near her Virginia home in 2012, she decided to get involved competitively. She can “deadlift” 370 pounds off the ground to hip-level. It is nearly double the weight that she could lift when she first started. “It started with me wanting to be stronger for derby, but it is a challenge that I’ve come to love,” Ms. McGovern said. “I’ve really gained this newfound respect for my body.